Dog that Most Resembles its Owner <- one of my favorite categories. The Grand Prize will have tails wagging; GUND will create a limited edition model of the winner’s dog. The dog will be available in gift and toy stores in 2013. That’s right! Your pup could become a GUND plush just like Boo! Isn't that cool? I know a lot of doggie loves that would LOVE this! It's really a great idea. To enter, submit your dog photos via the contest tab on GUND’s Facebook page. Winners announced the week of August 27th. 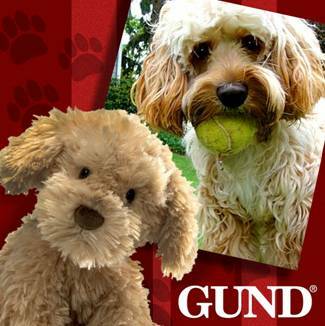 Simultaneously with the “Top Dog” Contest on Facebook,GUND will run the “Most Pinteresting Dog” Contest on Pinterest. Consumers will be asked to post their entry on their own pages, “tag” @GUNDMostPinterestingDog and submit the link to GUND at MostPinterestingDog@GUND.com. The “Most Pinteresting Dog” Contest winner will be selected based on the number of times the entry is “liked” on the GUND Pinterest board and the winner will receive a selection of GUND products valued at $250 retail. You get two different chances of winning great prizes and who doesn't love Pinterest? Hurry and enter and get your family and friends ready to vote starting August 6 - August 15! In the meantime, fire up that new Pinterest board and good luck! *Disclaimer: Information provided by GUND. I will receive a stuffed animal in exchange for this post. The opinions are of my own.